Ashburton Grove - Arsenal news and Arsenal opinion: Support your team - Koscielny deverstated - RVP out until April - League dream? Support your team - Koscielny deverstated - RVP out until April - League dream? Today in my opinion couldn't come quick enough for this group of Arsenal players. After Sunday's defeat we really needed to get straight back out on the pitch and play another game of football. Our chance has come sooner rather than later with the FA Cup replay against Leyton Orient tonight. It is chance for us all to move on from Sunday's disappointment. Whether through good or bad times, we all support this club because it holds a special place in our hearts. Going to the Grove tonight will ease some of the pain which is still there from our defeat. I know there are some who don't want to go tonight and I understand your reasons. But would you walk away from a friend who needed your help in a time of need? I know this team let us down once, but we as fans have to be there to support them through the bad times so that the good ones are all the more sweeter. I just hope there aren't thousands of empty seats tonight. That is my biggest fear, along with not progressing in the FA Cup. Please, if you have a ticket to the game tonight go and be vocal in your support for our team. There are bigger rewards to come at the end of the season and the players need us to be there. One person who has been left devastated by what happened on Sunday is Laurent Koscielny. The manager has said he's spoken at length with the player about what happened. "I have spoken... more to Laurent Koscielny because he suffered more. "You have to be realistic, analyse in a realistic way what you did wrong. But, as well, Koscielny has been a great player for us since the start of the season so it's important he keeps his confidence level well and that he gets encouragement. "He takes everything on board and we do not want that his confidence drops because he made certainly a mistake, he is really angry about it. We have, as well, to show that we support him and that we believe he is a fantastic defender." This season has been a huge step up for the Frenchman and for the most part he has proved very capable of playing at the highest level. 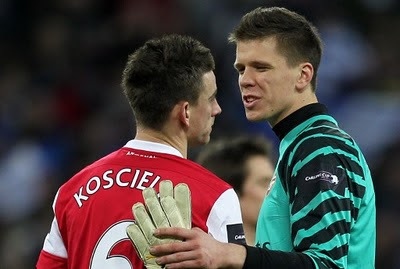 For me against Barcelona, Koscielny along with Jack Wilshere were our standout players. I really hope he can bounce back from this. It is a huge mental blow, but how he responds is key. We have seen this season there have been more good performances from him than bad and considering where he came from and how quickly he's adapted to playing at the highest level, Koscienly could be a mainstay in our defence for years to come. The manager has taken his countryman out of the firing line for tonight's game, saying in his interview with Arsenal TV Online Koscielny has a tight hamstring and is suffering from fatigue. Wojeciech Szczesny will also not play. Manuel Almunia being preferred but only because the Spaniard needs games. Early team news for tonight is that youngsters Ignasi Miquel and Conor Henderson could both be involved. They were left out of the reserves game with West Ham last night, which a young Gunners team lost 3-2. Abou Diaby is also set to return to the starting line up following his calf injury. Alex Song will however be missing. The injury update yesterday concerning Robin van Persie isn't good news. He will be missing for at least three weeks, meaning he'll miss the Barcelona game..
"It could be longer. The shortest delay we can imagine is three weeks." Already it means he'll miss the whole of March. I think the earliest we can realistically see him in an Arsenal shirt again is the game with Blackburn Rovers at the start of April. Not good news at all. The Sun predict he'll be out for six weeks. Lets hope that's not the case. However the manager was more positive on Cesc Fabregas who he said was improving and should be available for the game at the Camp Nou. I'll post a fuller preview of the team line up for tonight later in the day. Finally, how important was last night's win for Chelsea? Possibly the most important result in Arsenal's season?